Adare, County Limerick, Ireland / Local attractions and Sightseeing / St Mary’s Cathedral, Limerick. 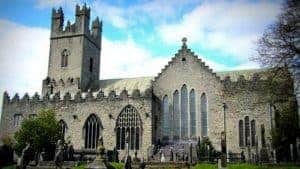 Saint Mary’s Cathedral was founded in 1168 AD and stands majestically over the City of Limerick on the banks of the River Shannon. It is one of the most important medieval buildings to survive intact in Ireland and is still performing its original function. It is believed to have been built on the site of a Viking thingmote (meeting place), and later the palace of the O’Brien kings of Thomond. It is an extraordinary building that has been ever-present during invasions, sieges, battles, wars, famines and times of peace. It is also a treasure of Irish religious art. One of the most famous features in Saint Mary’s are the carved misericords. These misericords are unique in Ireland and are the only surviving pre-Elizabethan carvings. They probably date from 1480-1500, perhaps from the restoration work carried out by the last pre Reformation Bishop of Limerick 1489 – 1522. We recommend you to visit the Cathedral, whether for worship, reflection, for a self-guided tour, or for a concert or special event. It is only a 30 minute drive from Adare.